Luke Leahy almost slipped from Falkirk’s party line this week – almost. 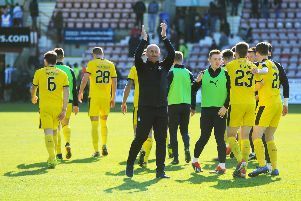 The Bairns have been adamant they are “looking after themselves” in the play-off race – and did so on Saturday when their rivals slipped up while Falkirk won 1-0 against Raith. The top four in the Championship meet one another on Saturday and the magnitude of the game at Tannadice is not lost on the left-back, who couldn’t quite bring himself to admit a win would go a long way to securing second. He said: “They’re all big games now. United are tough to face at Tannadice. “If we win... they play Morton last game of the season so something has to give.